Picture this scenario for a moment. You are at your residential, commercial, or industrial building in Tulsa, Oklahoma. You step outside only to notice an extremely foul odor in the air. Naturally, you look around the property to see where it is coming from with the hope that the wind has blown in the smell from somewhere else, and then your worst fear is confirmed. You see a wet patch of lawn or muddy puddle that stinks to high heaven. This can only be caused by one thing. The sewer pipeline has failed miserably. It is now leaking raw sewage and wastewater directly into the ground. You obviously want to have the problem fixed right away, especially before the puddle spreads and becomes an even worse environmental hazard. You also know that the sewer system can easily back up at this point, which means that it is a ticking time bomb. You are taking the chance with each passing minute that the raw sewage and wastewater will flood into your property as well as the ground. In this day and age, most people pull out their smartphone and begin contacting professional plumbers, as this is obviously a situation that you cannot attempt to fix yourself. So you get a few offers promising fast and effective service, but how quickly and efficiently will they actually be able to fix the failed sewer line? The other item you must be aware of is how much money will it cost you out of pocket. There are actually two sewer repair methods available. The one that your plumber plans to use will certainly determine how fast, efficient, and cost-effective the job will be. Most people are familiar with the traditional sewer repair method because plumbing contractors have been using it for a long time. It involves digging a large trench, physically exposing the sewer pipeline, making the essential repairs, and then filling the trench back in with dirt. Although it may sound like a simple process, it is not. The trench demolishes any exterior landscaping and hardscaping located above and around the sewer pipeline. It can take multiple weeks to complete the job and costs a significant amount of money by the time everything is said and done. In essence, the traditional sewer repair method is an expensive, time consuming, and destructive nightmare that can be avoided. Trenchless sewer repair is another story entirely for property owners in Stillwater, Oklahoma. Not all plumbing companies offer this innovative process because it involves purchasing new equipment and training employees on the latest processes. Nu Flow Technologies specializes in providing trenchless sewer repair services due to the fact that it helps our valued customers get through an unpleasant experience for the least amount of money and in the least amount of time. Our goal is to get your life back to normal as quickly as possible while performing our job to the best of our abilities. 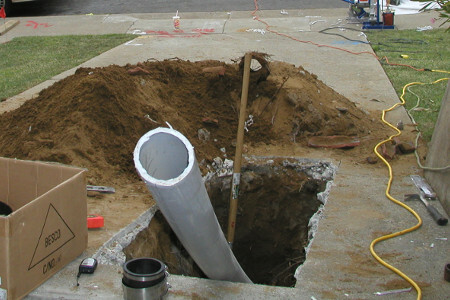 The trenchless sewer repair procedure does not require a trench. A small access hole or even an existing access point is used instead. Special machines insert an inflatable tube into the sewer pipeline through the small access point. The tube is comprised of a felt liner on the outside and an inflatable bladder on the inside. The felt is soaked in epoxy resin. When the tube is inflated the epoxy resin coats all of the interior surface areas of the existing sewer pipes. The process is also referred to as cured in place piping or CIPP for short. Once the epoxy resin dries, or cures in place it forms a brand new, solid pipe inside of the broken one. Although the old pipe still exists, the raw sewage, wastewater, and other materials travel directly through the new pipe. Nu Flow Technologies can complete the trenchless sewer repair process in a day or two. It is also approximately half the price of the traditional sewer repair method. So why dig when you can renew instead.